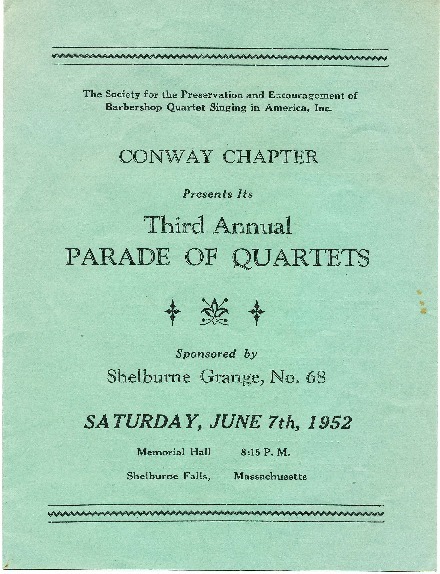 Four page, from a single 8 1/2" x 11" folded sheet, program of the Conway Chapter presenting its "Third Annual Parade of Quartets" concert, sponsored by the Shelburne Grange, No. 68. Two copies on green paper. Gift of Janet & Carl Nelke, Conway, Mass. Society for the Preservation and Encouragement of Barber Shop Quartet Singing in America, Inc., Conway, Mass. Chapter, “Barbershop Quartet Concert Program,” Conway Historical Society, accessed April 21, 2019, http://conwaymasshistory.org/items/show/845.